I take great pride in my extensive experience as a boater and the various skills I have mastered along the way. But you should never get too confident or take anything for granted. Even the most experienced boater can make a rookie mistake. I know. I wish that I could say, in all my years of operating a boat, that I have never been left high and dry. There are few mistakes as embarrassing as running aground. It can be costly as well as dangerous. It is no fun, sitting on a sandbar for six hours waiting for the tide to come back. Most of the time, if you are high and dry, there is no way to even pull you out. Waiting is your only option. And it can be a long, embarrassing wait. There are typically two ways that can cause your boat to become grounded. One is to be anchored or beached and not paying attention as the tide recedes. Then, when the tide goes out you are stuck. The other way is take your boat outside of the channel. And that happened to me in 1992 when I went up to Cumberland Island with two friends on board. We had gone into an area that I was not familiar with. I was talking instead of paying attention to the channel markers, which took a big swing to the west. Unfortunately, we up on plane so when we got grounded, so we were grounded good. And to make matter worse, the tide was still going out, so we had to sit through low tide, then wait for the tide to come back up before we could get free. For starters, it is critical to understand the importance of tides and currents when operating a boat. The tide is the flow of sea water, either toward or away from shore, due to the pull of gravity of the sun and moon. No matter where you boat, anywhere in the world, tides are predictable. The current is the speed of the flow of water that creates a change in the height of the tide. As the time for high tide approaches, the sea water begins to flow toward shore, first slowly and then with increasing speed, creating current. Toward the end of the tidal cycle the current moves with less speed. Once high tide is reached, the inward flow stops, resulting in “slack water.” Then the process starts in the opposite direction, and the outward flow begins, eventually resulting in low tide. Tides and currents are very important to understand as they affect boat handling, particularly during beaching a boat, or docking activities. To avoid be stuck aground, know the time for high or low tide. You should be prepared to adjust your anchor or move your boat, as needed. 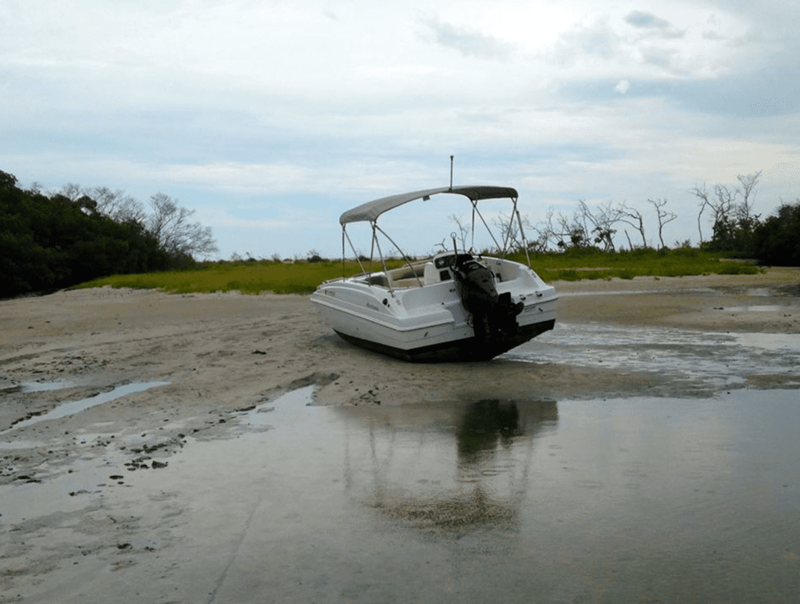 Paying to tow a grounded boat off the beach can be a very costly. In addition, chasing a boat that has floated free, and is suddenly loose in the outgoing tide and current, can be dangerous. Smart boaters will take the time to thoroughly familiarize themselves with tide and current conditions before heading out for the day. The more you learn and practice proven strategies for success, the more enjoyable will be your boating activities! Do you have your own tale about getting your boat grounded, or some other mishap? I’d love to hear your story. Email me at: l.almeida@freedomboatclub.com.